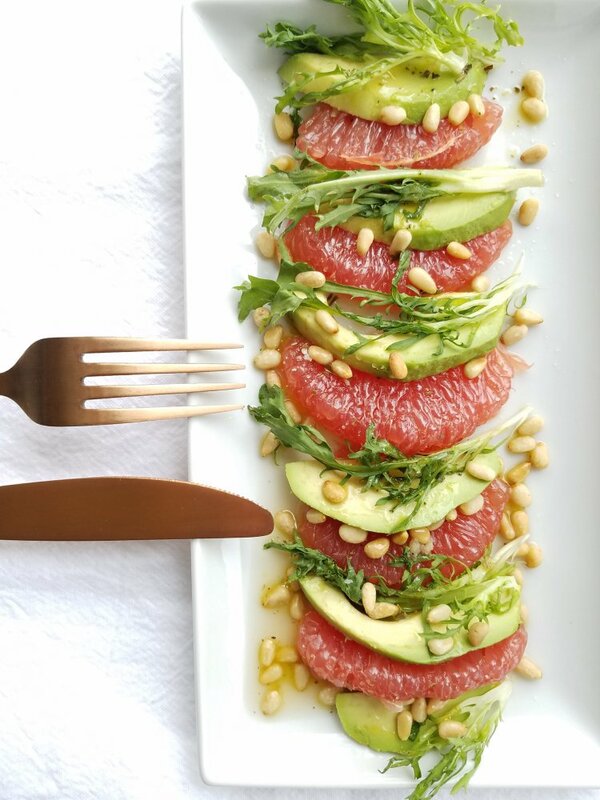 Take your salad game to the next level with this delicious mix of Avocado, Grapefruit and Frisee. Thinly sliced avocado, perfectly juicy grapefruit and beautifully crunchy Frisee, give this salad a great vibe. I topped it with my Delicious Salad Dressing and toasted pine nuts. So good! I don’t know about you, but when I was a kid I used to eat grapefruit sprinkled with lots and lots of sugar. Eating a grapefruit was a commodity though. Any type of citrus or exotic fruit was a once yearly treat and usually received as a Christmas gift. Thank you, Communism. So guess what? For this salad, I did sprinkle the grapefruit with sugar, which took the flavors to a whole new level. It worked really well with the avocado too. An old co-worker, thought me that an avocado can be eaten with sweet components too. I had no idea and thought it was the oddest thing; until I tried it. It is quite delicious! A quick Google search enlightened me that in various parts of the world, where avocados are commonly grown, they are in fact eaten like a dessert and as the fruit that it actually is. Give this salad a try. Impress your dinner guests with it or just make yourself feel good with it. As always, please let me know your thoughts. I welcome your feedback and chatter on my posts or in private. Thank you for reading! Peel the grapefruit and remove the meat from the skin (This might be the most time consuming part). Cut the avocado in half and remove the seed. Slice the avocado into thin slices. Drizzle with dressing and pine nuts. Add all of the ingredients to a mason jar. Secure the lid and shake it all up really well. If time permits, refrigerate the dressing to allow the flavors to blend nicely. Shake up and serve over your favorite mix of fresh ingredients.